Colleges are beginning to understand that they need to be more accommodating for students. They are creating many different ways of learning such as online courses and night classes that help students by adding flexibility. I am not the biggest online course fan, but during the two that I took during undergrad and grad school, I learned a lot of tips on taking them. 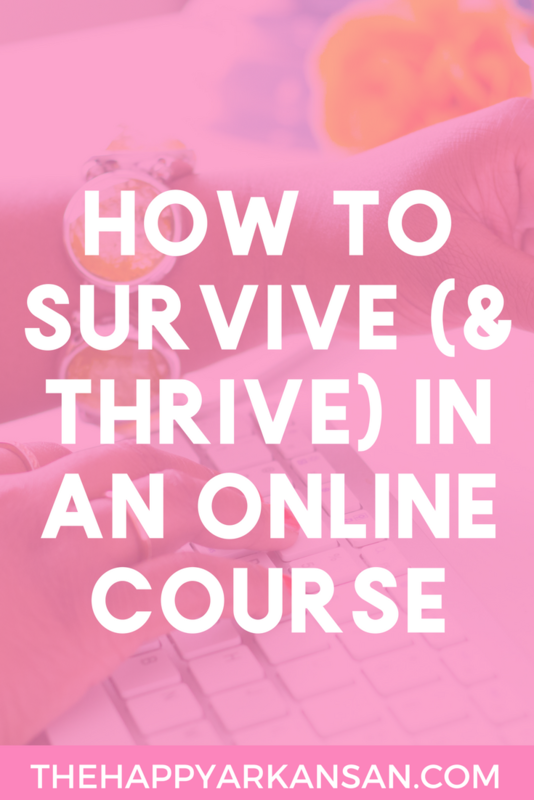 Today’s post is going to be all about how to survive and thrive in an online course. Part of my school money came from the Arkansas Lottery Scholarship which has a four-year maximum. If I didn’t manage to graduate in four years, I wouldn’t have had the money to keep going without taking out way more loans than I wanted to. So, I made my four-year time framework, and today I am going to show you exactly how I did that. My undergraduate institution had a perfect advising system. Our first year was spent with a general adviser, but if we declared our major, we had a professor as an adviser from our Sophomore-Senior years in college. I loved my adviser deeply, but I was such a control freak with making sure that I knew exactly where I stood when it came to graduation. I made and updated spreadsheets with my course schedules in it all the time; I’ve probably printed dozens of general education, major, and minor check sheets; and I just made sure that I was the most knowledgeable person about my own college education path. Yes, your advisers can be the most helpful people in the world and I loved mine (and I even took two courses with her during my time in college), but you should take an interest in your own graduation check sheets. When your adviser is advising tons of students, it can be easy for your information to fall through the cracks. While that never happened to me, it could happen to you. Advisers get changed, advisers lose information, and then those things can have a major impact on your graduation time. How many total hours do you need to graduate? Usually, this is around 120ish. How many upper-division hours do you need? Your college career can’t be strictly made up of freshman and sophomore level courses. You probably have a specific amount of your hours that have to be at the junior and senior level. What courses do you need to take for your major(s) and minor(s)? How many hours do your major(s) and minor(s) require? Once you understand your requirements, you can make sure that your entire course schedule revolves around them. For instance, I had taken way too many freshman and sophomore level courses, and I almost didn’t have enough hours to take all of my upper-division hours. I ended up taking 15 upper-division hours my last semester at UCA which happened to be just enough credits to fulfill my upper-division credit requirement. I was never one to joke around with courses in college. Going to college is a privilege that not many people get to experience, so your coursework needs to come first. Even if you are just taking a physical education class or a class on film theory, you need to take it seriously! When you do that, you are able to get a higher GPA, avoid academic probation, and make sure that all the courses you finish end up counting for something more than a harsh lesson. Now, I did think about dropping my courses, but I never actually went through with dropping a course until I got to graduate school. By not dropping any of my courses I always got all of my credit hours each and every semester which was super helpful to graduating on time. Sometimes dropping courses is almost mandatory to avoid getting a super poor GPA, but I would not drop classes if you can avoid them. If you have to, you need to make them up at a later date. I really thank the Arkansas Lottery Scholarship for that because it required me to take at least 15 hours every semester except for my first one (but I took 15 hours that semester too.) If you want to graduate in four years without summer classes you need to be taking at least 15-18 hours each semester. This means that you need to be a full-time student, otherwise it’s pretty difficult to graduate in four years without a ton of extra summer semesters. Another thing that I did was understand the importance of balance. I tried to understand the different courses that I had to take and I never tried to pair too many difficult courses in one semester. Even if I had to take many upper-division courses in one semester, they weren’t all built the same. I understand that every major cannot have the same amount of balance, especially when you are a STEM major, but if you can, create some balance in your course load through a fun class or an easy class when possible. Obviously, you don’t want to take Basket Weaving 101. You want the easier class to be pertinent to you or your interests. Think about which courses will be the most difficult and see if you can spread those out among all eight semesters versus taking multiple difficult classes in one semester. Now, that’s not to say that I didn’t change around what I did quite a bit. I started as a History/Sociology Double Major. After my first year, I dropped my double major and majored in Sociology with a minor in Writing. After about another year I changed my minor from Writing to Public Relations. Finally, right before my senior year, I changed my minor for the last time to Anthropology because I could use some of the excess courses I had acquired in Sociology for an Anthropology minor. Last, but not least I did end up adding a Criminology concentration to my Sociology major literally right before I turned in my graduation paperwork. I already had the hours from taking the Criminology concentration coursework, so the people I worked with in the Sociology office convinced me to add the concentration right before I graduated. In case all that was confusing, I ended up getting my Bachelor’s in Sociology with a concentration in Criminology and a minor in Anthropology. Yeah, that’s a handful. While I changed my minor a lot, I knew when I needed to settle down and pick the best minor for the courses I had already taken. I never changed my major after my freshman year though. If you can, stick with the major you love. College is tough, and you will need a lot more from a major than the fact that it will make a ton of money in the future. I am not saying that no one has genuine love for tough majors like those in the STEM field. You can totally adore all things STEM! But you also have to understand why you love STEM. Is it because that field has so many well-paying jobs or because that field really excites you? Most people I knew who went into STEM because of the money didn’t make it, they only made it if they had a genuine love of STEM past their desire for a healthy paycheck later in life. So, with that being said, use your freshman year to experiment, take courses outside of your comfort zone, etc. I am not rushing you to pick a major because there are probably a ton of general education requirements you need to get out of the way first, but the sooner you declare the better your chances of graduating on time. Last, but certainly not least, I sought help when I needed it. College can get tough and you never know when you may have an issue adjusting to something or doing something. Your college is filled with amazing resources to help you conquer all of those issues, but colleges aren’t always the best at reaching out to people who need their resources (even though they try.) So you must be proactive, reach out to the right resources so that you can get over any speed bumps you may have. I would suggest reaching out to your academic advisor first because they can be extremely helpful with showing you resources you didn’t even know your campus had. I was extremely lucky in that just doing the above helped me graduate on time. Here are a few other methods that will also potentially help you. I never took a summer course until I went to graduate school, but taking a summer course can help you get back on track to graduate in four years. I would consider taking a summer course so that you can focus on a particularly difficult class or so you can retake a course that you dropped during the year. If you take summer courses strategically, you may even be able to graduate early! If you don’t mind losing a bit of your flexibility, many colleges often offer four-year plans before you sign up for your first courses. 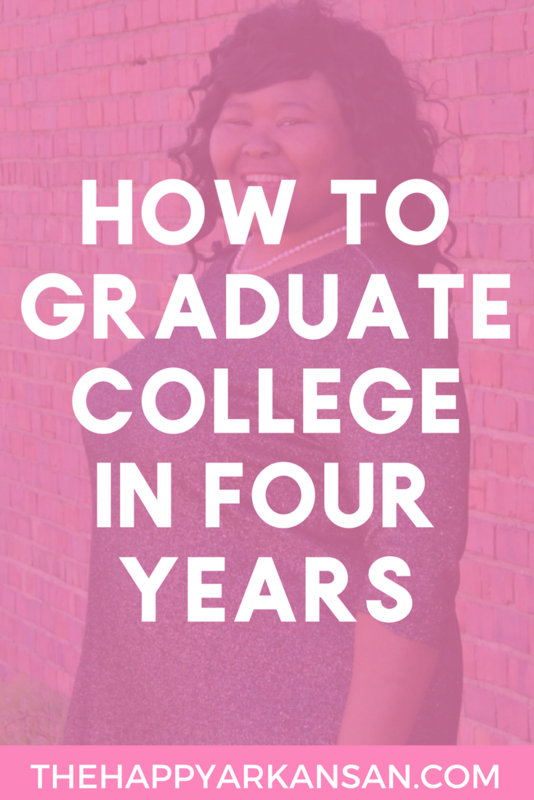 These plans are strict regimens that you take semester after semester that allow you to graduate in four years if you follow the plan to a T. Many schools offer these plans, but it’s definitely not as flexible as creating your own four-year plan. Four-year plans (also known as degree plans, eight-semester plans, program completion plans, etc.) often focus on getting your general education requirements done extremely early in your college career. For example, the four-year plan for my alma mater wanted me to complete two science courses during my first year of college, which I just didn’t want to do. I would definitely encourage you to look over the four-year plan for your school just to see if you like it. If not, they also are a great thing to model your own plan off of. Do you have a lot of knowledge already? You may want to use an AP or CLEP exam to get out of some of your college hours. AP stands for Advanced Placement. If your school has any AP classes, you can get credit for courses by scoring a high score on the exam (usually by scoring a 3 or 4). This is great for testing out of courses like college writing, college algebra, world history, etc. The great thing about AP tests is that they are paid for by your high school so you don’t have to pay for them out of pocket. They are extremely lengthy tests though and you have to be really prepared for them to make a good grade on them. There is also a CLEP test. CLEP stands for College Level Examination Program. These tests run about $100 a piece (which is a fraction of the cost of a college course) but they also require a lot of preparation to master. Your school may have a limit on how many hours they will allow you to CLEP out of too, so remember that as you are deciding which tests to take. Graduating in four years is not an easy feat. With so many distractions and the difficulty of college courses, more people are taking a longer time to graduate. For me, I graduated in four years out of necessity. I couldn’t afford to spend longer than four years on my college degree, but you may have another reason for wanting to graduate on time. Whatever your reason, I hope this advice has helped you out! Why Do/Did You Want To Graduate In Four Years?